I'm trying to implement a Chat screen using UICollectionView in Swift 4.2. I've done it. I want to improve it by making the cells grow from bottom to top instead of top to bottom (while keeping the order of messages too). Any help? I've tried searching for it, still unsuccessful. 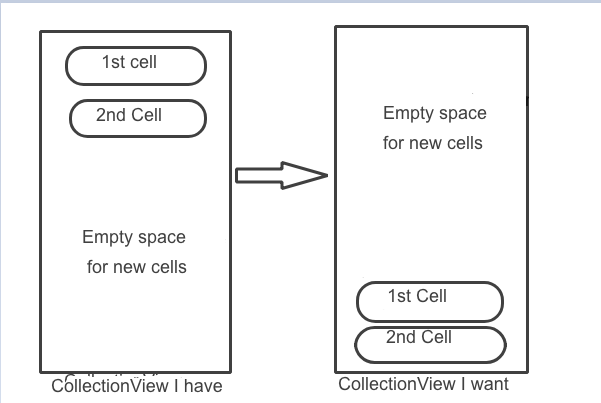 You have to make collection view height constraint outlet for it and calculate your cells height after that you can set height of collectionView. and one case will come of maximum height, your collection height will equal from screen height with calculate space your navigation and input textview. An iOS app was a initially paid app, then later became free with an in app purchase option. For a user who has already purchased the app would the restore code below, actually restore it? Or does that restore only app specifically to the in app purchase? I have a UILabel but it has extra padding on the top and bottom for some reason. I'd like the height of the label to be exactly the height of the text inside it. I've been searching around on other questions and can't seem to find a solution that actually works. Or the solution requires you to call something in your layoutSubviews method of your VC, but I want all my view code to be stored in my view file. Now I have a PostsController, which is a TableViewController. It contains PostCell. At some point, I want to put another PostCell into one PostCell. What I mean is inside this PostCell, there is also a PostCell. How should I do this with codes in Swift? If I convert "2019-01-01T00:00:00+0000" to a date, I would like the date to be the date in the string - January 1, 2019. And if I calculate the number of seconds in the time portion, I would like the result to be zero. The problem is, when I convert my string into a date, it is stored in the UTC timezone. My locale is set to "en_US_POSIX", and my time zone is set to current. My date formatter uses "yyyy-MM-dd'T'HH:mm:ssZ". I know that the final Z means UTC, but I can't seem to figure out the correct field symbol to get the results I want. If I put this method inside the class, it's called; however, if I try to use as the default implementation via protocol, it's never called.